This new combined Dictionary and Thesaurus ensures you'll always have the words you need at your fingertips. With matching dictionary and thesaurus entries on the same page, you'll never be stuck for words again! Collins New Zealand School Dictionary and Thesaurus will help you find all the words, definitions and alternatives you need. 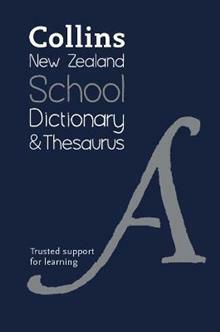 Suitable for all school users, its clear, straightforward definitions reflect today's language, while the matching thesaurus entries provide a generous choice of synonyms. Including specifically New Zealand English and Maori content, it also contains themed lists New Zealand terms. Dozens of word web pages offer a mind map approach with alternatives for commonly over-used words.